It took Christal Presley many years to understand how a war that took place before she was even born had marred her life. Her father, Delmer Presley, was traumatized by a yearlong tour of Vietnam, which in turn affected Christal. After a series of difficult conversations with her father, Christal journeyed to Vietnam to see the place where he had fought. 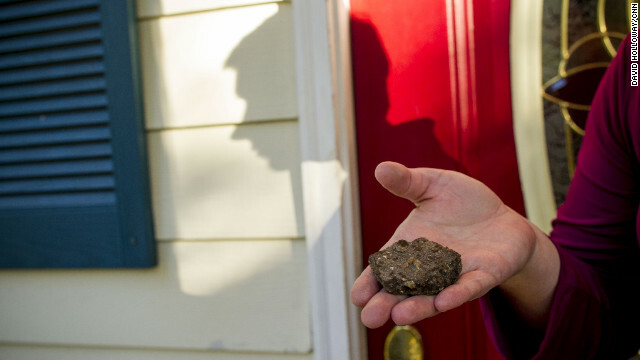 She brought home a piece of asphalt from the landing zone used by Delmer's Army unit. Christal's conversations with Delmer resulted in "Thirty Days With My Father," a gritty book that tells the story of a woman troubled by her father's wartime trauma. 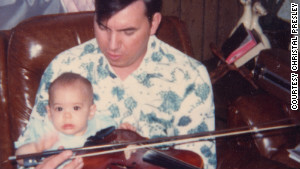 Christal knows that music saved her father's life. He bought her a guitar a few years ago because she now wants to be able to play like him. Christal settled into a new life in Atlanta, but she kept searching for inner peace. She knew she would not find it until she spoke with her father about Vietnam. Is there a veteran in your life? Share their story on CNN iReport this Veteran's Day. (CNN) -- Inside a trailer in Honaker, Virginia, is a 5-year-old girl who loves lemon-lime slush. She sleeps in a room with a quilted bedspread and matching purple curtains. She adores her cat Tiger, dogs Smoky and Rusty and a black, pop-eyed goldfish. Her family is poor, and she is eating potted meat, blowing away cracker crumbs that fall into her lap. "Daddy," she whispers when her father, a welder, comes home. He does not respond. His eyes are wild. He collapses into a rocking chair, his hands trembling, his breathing labored. She doesn't understand her father's strange behavior. It's as though he's in the grip of the devil. She hides behind the couch, her knees press against the shag carpeting. Later, she will remember this moment as the first time she was afraid of her father. Christal Presley, 34, held her breath for two seemingly endless days in mid-October. In Honaker, more than 300 miles away from her home in Atlanta, her father had just received a package in the mail. It contained an early copy of Christal's new book. On the cover: a sepia-tone snapshot of Delmer Presley holding his rifle in Vietnam. Christal had staked her whole life on words crafted from love and pain. But what would they mean to her father? Delmer Presley, Christal Presley's father, was drafted before his 19th birthday and served a year in Vietnam. Would they offer comfort like the conversations that resulted in the book? Or would they act as another trigger point for a man who never left war behind? "Thirty Days With My Father" is a gritty memoir written by a woman haunted by what some psychologists describe as second-generation post-traumatic stress disorder. The trauma began in Vietnam, affected Delmer and then Christal, says psychiatrist Frank Ochberg, a trauma expert who served on the committee that defined PTSD in the post-Vietnam era. Christal, he says, suffered profound injury. And it stayed with her. Outwardly, her life appeared successful: She settled in Atlanta, owned a house, worked as an educator. But she always felt a hole in her soul. She didn't know her father -- or herself. How was it, she wondered, that a war that ended before her birth had marred her life in so many ways? The book became Christal's salvation -- "my last resort to find happiness," she says. But she worried about how her father would feel seeing his troubled life exposed to the entire world. Encourage him to read the ending first, she told her mom. That way, he will understand: It's not just an ugly portrait of pain. It's a book about healing. Christal grew up affected by the post-traumatic stress disorder that her father suffered after fighting in Vietnam. 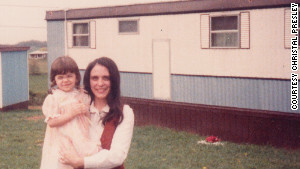 Christal was only 5, but she remembers clearly that day when her family came undone. Her father, on his way home from work, had come upon an accident on the highway. His friend, Josh Coleman, was dead. It was the first time Delmer had seen a body since he returned from his yearlong tour of duty. 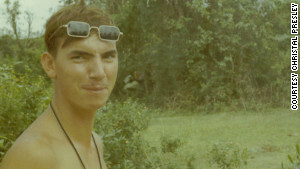 Thirteen years had passed, but instantly, his mind reeled back to Vietnam: to underground tunnels brimming with snakes and booby traps laced with sharp punji sticks that skewered his buddies like meat. Christal never knew normal again. Gone was the man who gave her piggyback rides, ate mud pies and smiled as he watched her play an angel in a school play. Delmer vacillated between depression, silence and sheer rage. He locked himself in the bedroom his wife had decorated with shadow boxes filled with Delmer's medals, Army boots, hats, dog tags and a worn pocket-size military-issue Bible. The room screamed war, Christal says. She was scared to enter. At Christmas, Delmer never watched Christal open presents. She could hear him playing music in his room. She learned to resent the guitar her father loved so much. She wished he would spend time with her, speak to her, seek solace in her. When a truck backfired or Christal dropped a plate by accident, her father leaped up and went into soldier-at-war mode. Christal hated going out to eat at noisy restaurants -- everyone just stared. The worst moments came when he picked up his shotgun and left the house for Little River, announcing to Christal and her mother, Judy, that he was going to kill himself. As time passed, Christal forgot the daddy she'd once known. Judy, a Pentecostal Christian, believed you had to be perfect to reach heaven and kept the family's struggles secret. Christal pretended to the outside world that their life was normal. Once when she was 6, she stole a neighbor's photo of a family trip to the beach. She cut the family's smiling faces out and replaced them with pictures of herself and her mom and dad. She showed the doctored photo off in class, describing for her classmates what a great time they'd had. 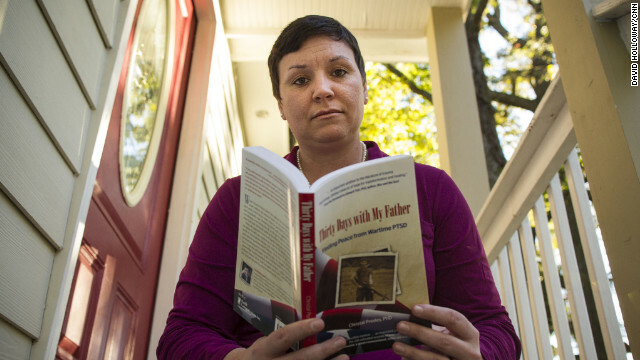 Ironically, it was Delmer's trauma that enabled Christal to escape her parents' home. Until then, every birthday had not been a celebration as much as it was a countdown to the day she'd turn 18 and be able to leave. The federal government paid for her schooling at Virginia Tech in Blacksburg. That's because by then, the Army had declared her father 100% disabled. When Delmer returned from Vietnam in 1970, psychiatrists were just starting to recognize PTSD as an impairment. The first diagnosis for Vietnam veterans did not occur until 1980 when Christal was 2. Veterans weren't encouraged to seek help, like they are these days. "My dad just thought he was going crazy." As frightening as it was for Christal to leave Honaker and be alone for the first time, she felt liberated. 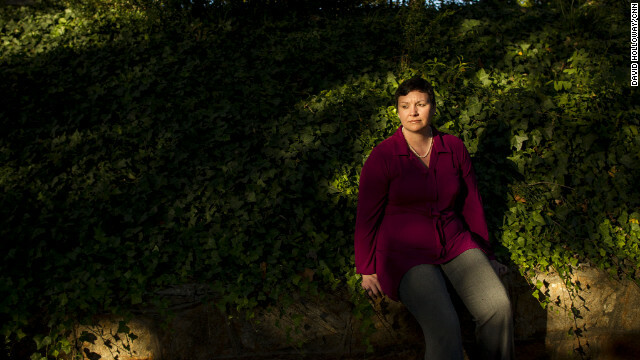 "I was so tired of living in a war zone," she says. "I really thought my father ruined my life." As a girl, she had taken a razor from her mother's sewing kit and sliced her skin open. She cut herself with an ink pen and stapled her hands. Hurting herself was a way to be close to her dad. He was in such pain, she thought, that she would be, too. In college, she mixed anti-depressants with rum and tequila and drank alone. She wanted to numb herself like PTSD sufferers do. She had her father's eyes -- and his behavior. Severe mood swings. Anxiety. She was hypersensitive to sounds. She stood back and skimmed the crowd in a room, looking for the quickest exit. She was private, reserved. She didn't trust people. She told Delmer she hated him. She went through boyfriend after boyfriend, craving a man's touch, looking for the affection her father had never shown. She dreaded driving back home for Thanksgiving or Christmas. As she approached winding John Douglas Wayside in Abingdon and began her climb up the Virginia mountains, she had flashbacks. She saw herself as a child wrapped tightly around Delmer's legs, trying to prevent him from going down to the river to kill himself. Or lying on her bed, curled into a fetal ball. In college, she saw a therapist regularly and didn't speak to her father, except peripherally, for 13 years. In that time, she came to understand that her troubles were related to his. 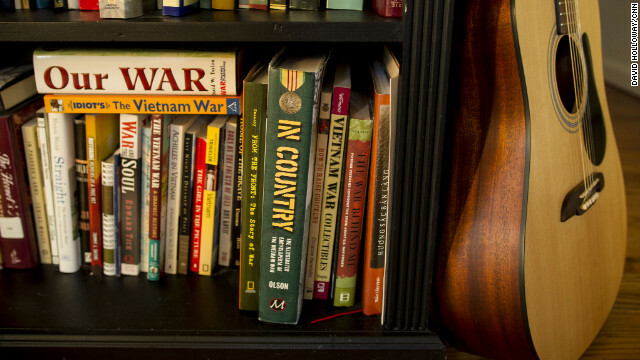 "My father got that way from being in Vietnam," Christal says. "I got it from being around him." 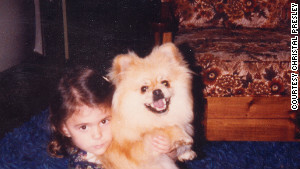 A baby Christal sits on Delmer's lap. He found solace in his music and would sometimes play the guitar eight hours a day. 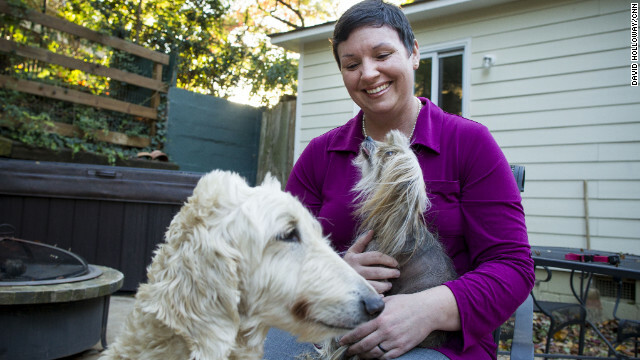 After college and teaching jobs and a brief marriage, Christal settled in Atlanta. But she ventured in several directions in search of an inner peace: to holy sites in the Indian Himalayas, to the halls of academia, where she earned a doctorate in education. Always, she came up empty. She'd begun writing as a way to understand herself and work through her problems. One day, her coach in a writing group challenged her to take on the subject she feared most. Her father. She decided to ask Delmer if he would participate in a series of conversations about Vietnam. Just in case things became unbearable, she set a time limit for her project: 30 days. She could stand anything as long as an end was in sight. She was sure Delmer would refuse. Why would he speak about it now when he had kept it to himself for almost four decades? When Delmer said yes, Christal was taken aback. She had been so certain he would not participate that she didn't even know how to begin. The first few conversations were strained. Delmer sounded suspicious. But by Day Four, he was telling her how he got a draft letter just before his 19th birthday. "It was after the Tet Offensive, the worst time to be drafted," Delmer said. The surprise North Vietnamese military campaign is considered the turning point of the war. "America saw right then that this wasn't going to be a fast war," he said. "The American people went berserk, turned against their own. They stopped supporting the war, hated us soldiers like devils." Christal was humbled by her father's words. And appalled to learn of the public scorn. Such a thing would never happen today, she thought. The conversations continued day by day, through the end of 2009. Delmer talked about Agent Orange, the defoliant that rained down on the jungle from U.S. planes. He blames it for a tumor he developed in his right lung and cysts on his fingers. He told her he placed men he knew in body bags for their final journey home. She asked whether he was in My Lai when U.S. soldiers were ordered to wipe out the village -- unarmed civilians, including women and children. Delmer told her he was not but that he was ordered to pull guard the day Pentagon authorities went in to investigate. Christal had read about My Lai. She told her father that 500 bodies were found. "You are wrong about that," Delmer said. "There were 504." Christal had not known her father's anguish until then -- the moments he relived, the guilt he felt for surviving. With two months left in Vietnam, Delmer welcomed another young soldier to his platoon. The commanders made Delmer trade places with the newbie, who was placed at the front of the line in their battlefield maneuvers. Christal's mother, Judy, was embarrassed by the family's struggles and urged her daughter to keep them secret. The soldier stepped on a booby trap. Delmer never came to terms with the soldier's death. He knew the young man had a newborn daughter he had never seen. Delmer lay awake at night thinking: "It should have been me." When her father shared that story, Christal was silent on the phone. She'd thought of her dad as a guy pointing a gun -- not as someone who suffered. Days after sending a copy of her book to her father, Christal met a woman who wanted to write about her project for a blog called Family Of A Vet. They talked over lunch at Tin Lizzy's restaurant near downtown Atlanta. The woman's husband did three tours of Iraq and is disabled by PTSD and traumatic brain injury. She takes care of him and her three young children. Daughter Caitlin, 9, had come along. Christal was talking about her 30-day project when Caitlin piped up. "Christal," she said. "My mommy says your daddy was in a war, too." "Yes, a long time ago, my daddy was in a war called Vietnam," Christal told her. "Miss Christal," said Caitlin. "Were you scared of your daddy like I am scared of mine? My daddy yells a lot, and I go into my room and hide." "Caitlin," said Christal. "Sometimes when someone comes back from war, they can't help themselves. Like a baby who cries." Christal had always thought her father was distant and detached because he didn't love her. She always thought it was her fault. "Yeah, because they've seen bad things," Caitlin said. Christal had spoken with other grown children of Vietnam veterans. But this was the first time she saw herself in a child. Christal contained herself in front of Caitlin. But when she and her mom drove away after lunch, Christal burst into tears. It was a week before her book launch. Christal had a calendar chock-full of media interviews. She was confident that veteran communities would welcome her book. She was less sure about her father. It took him two days to finish reading. The phone rang, finally, on a Tuesday afternoon. "It's a good book, Christal," Delmer told her. No other review was going to matter. Along a living room wall in Christal's home in Atlanta stands a case containing a new Alvarez guitar. Delmer bought it for her three years ago, the first time they spent Christmas together after the 30-day project. She'd told him she wanted to learn how to play. She knows that without his music, her father might be dead. It kept him going after he couldn't work anymore. It was like an extra limb. Sometimes he played for eight hours a day. He loves Ricky Skaggs, Ralph Stanley. War songs. Even wrote one himself. "Having the guitar here makes me feel like a part of my father is here," she says. He sketched out chords for her on pieces of white paper, but Christal has been so busy finishing her book, she hasn't had time to learn. Soon, she says, she will. The guitar is not the only talisman in her home tying Christal to her father. Inside a small silver urn is a piece of a sandbag. The color is still a vivid sky blue. Next to it is a piece of asphalt. She found them in Vietnam. After the series of talks with her father, Christal felt compelled to go to Vietnam, to Chu Lai, down Route 1, to the place the Americans called LZ (landing zone) Bayonet, to the fire base known as Fat City. Soldier's Heart, an organization that supports veterans and their families suffering from psychological wounds, made the trip possible. She climbed the slope of the landing pad where her father had slept. She gazed at a trench overgrown with grass and yellow wildflowers. The mountains behind her must have been where a young Delmer schlepped through thick jungle with a gun in his hand and a radio strapped to his back. She could still see tank tracks embedded in the asphalt. And boot prints. Christal stepped inside, Vietnam surging through her body. She felt ashamed she had treated her father the way she had. If only she could go back in time. Delmer felt the same way. He told her he locked himself away because he didn't want to hurt her. "I let her down," he says. "It's my fault. I didn't realize I was hurting anyone." One time, he was frantic on the phone with Christal. He hadn't burned any villages or killed any people, he told her as though someone were accusing him. She no longer thought him crazy. She told him he's the bravest person she knows. She is sorry she couldn't see that earlier. "I forgive you. I forgive myself," Christal told him. Delmer says he's happy, at least, that before he hangs up the phone with Christal these days, he can say: "I love you." There is a temple in Vietnam, lush with ponds and trees with branches hanging low. Outside, merchants sell birds, turtles and fish. Christal learns that people buy them and set them free in the temple, in accordance with the Eastern belief of the eternal nature of the soul. She thinks back on a childhood fishing trip with her father. The fish she caught swallowed the hook and worm whole. It bled through the gills and gasped for life. "She's dying," Christal howled, begging Delmer to save it. Delmer was calm, confident. He cut the line, freed the fish and assured her it would live. It struggled for a few seconds and then dived deep into the water. Christal thinks now her father is like that fish -- a survivor. It is the day before she is to leave Vietnam and journey home. She steps forward, peers at the bags of goldfish for sale. One is black, like the fish she had in her aquarium as a little girl. That's the one she chooses. She walks over to the pond, opens the bag and watches the fish swim away.